When he agreed to cover the 2016 election season, journalist Jared Yates Sexton didn't know he was stepping into what would become--for both political parties--the most rageful and divisive political circus in U.S. history. His initial dispatches showed Democrats at war with their establishment, coming apart at the seams over the long-gestating ascendancy of Hillary Clinton and the upstart momentum of Bernie Sanders, whose grassroots campaign provoked uprisings of people desperate for change. Then, on June 14, Sexton attended a Donald Trump rally in Greensboro, North Carolina. One of the first journalists to witness these rallies and give mainstream readers an idea of the raw anger that occurred there, Sexton found himself in the center of a maelstrom. Following a series of tweets that saw his observations viewed well over 1 million times, his reporting was soon featured in The Washington Post, NPR, Bloomberg, and Mother Jones, and he would go on to write two pieces for The New York Times. Sexton gained more than 18,000 followers on Twitter in a matter of days, and received online harassments, campaigns to get him fired from his university professorship, and death threats that changed his life forever. 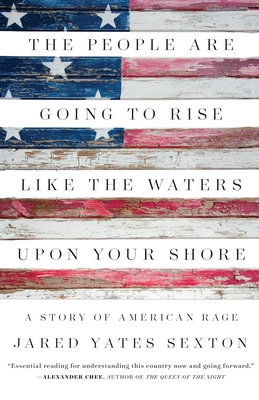 The People Are Going to Rise Like the Waters Upon Your Shore is a firsthand account of the events that shaped the 2016 presidential election and the cultural forces that divided both parties and powered Donald Trump into the White House. Featuring in-the-field reports as well as deep analysis, Sexton's book is not just the story of the most unexpected and divisive election in modern political history. It is also a sobering chronicle of our democracy's political polarization--a result of our self-constructed, technologically assisted echo chambers. Like the works of Hunter S. Thompson and Norman Mailer--books that have paved the way for important narratives that shape how we perceive not only the politics of our time but also our way of life--The People Are Going to Rise Like the Waters Upon Your Shore is an instant classic, an authoritative depiction of a country struggling to make sense of itself. JARED YATES SEXTON's political writing has appeared in the New York Times, the New Republic, Salon, and elsewhere. He is the author of three collections of fiction and a crime novel. Currently he serves as an associate professor of creative writing at Georgia Southern University.